On a road trip recently when I stopped at for a bite at In and Out Burger (of all places) and observed something very frightening. A family of 3 – mother and two teenagers sitting at a table after finishing their meal. All three were typing on their Blackberries with their head slouched down and silence between them. Because I found this so disturbing, I sat and analyzed them for 10 minutes. The whole time the family did not exchange one word or display any eye contact. I didn’t feel bad staring because I knew they would not notice my glare. As they stood up, the mother and the daughter were still on their phones – one with a pink case and the other with a yellow case. They walked away from the table leaving the son to carry all the trash. The girls were STILL on their phones as the boy struggled to the garbage can. As they walked out, not one word was exchanged. Smart phones addicting? – YES. This time spent optimizing our experience can distract us from producing “art,”or developing tangible business. Even worse, it can distract us from physical activity or social outings face to face with our “friends.” How many times have you sat a dinner table with friends and realized that everyone is checking their phones? People have a difficult time turning it off. This distraction might keep you from the best workout of your life because you wanted to stop and chat or text with someone on your phone two miles into your run. According to Steven Pinker, a professor of psychology at Harvard, author of “The Stuff of Thought,” the new media have caught on for a reason. Knowledge is increasing exponentially; human brainpower and waking hours are not. Fortunately, the Internet and information technologies are helping us manage, search and retrieve our collective intellectual output at different scales. Far from making us stupid, these technologies are the only things that will keep us smart. Social media has become essential to all large or small business marketing or large scale movements. Branding is the new word for the American Dream. Make yourself or your company into something for free on the internet. 1) Use HootSuite to consolidate all your social media into one location. This allows you to select which accounts to upload links or posts (Facebook, Twitter, WordPress, LinkedIn and multiple accounts all on the same page) to so that you can distribute to appropriate followers. HootSuite also allows you to schedule your posts so that you can save yourself time from logging in again later in the day. This application makes self marketing and promotion achievable for those who don’t have the time to do it while at work. 2) Use iGoogle as your home page. Google allows people without a gmail account to sign up and organize your page to check Facebook, Twitter and your favorite blogs or news pages via Gadgets (like applications). See my iGoogle page below with all handpicked Gadgets. 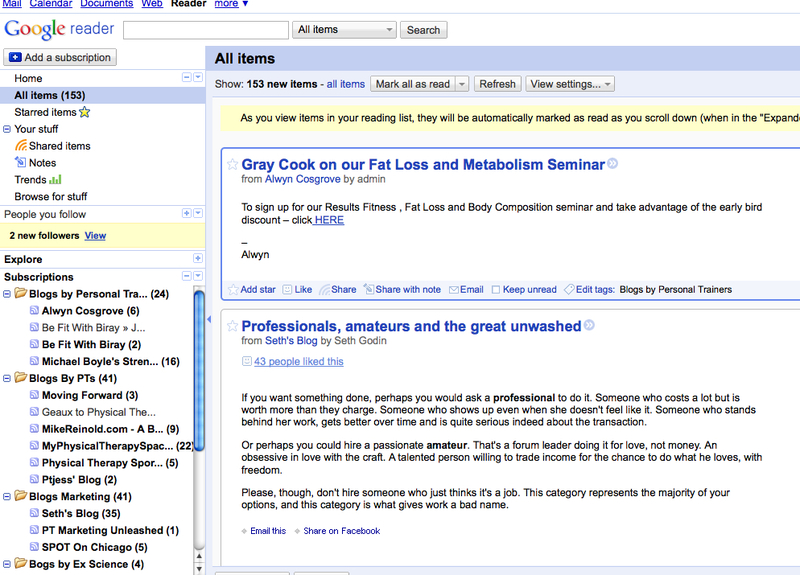 If you need to stay up on research in your field add Google Reader to your iGoogle page. Google Reader sets up your favorites blogs, news sites or any other consistent search criterion you want to stay on top of. It will even track a search on PubMed via RSS. If you aren’t sure what RSS is, then you will have to ask someone else, because I can’t quite explain it myself. 3) Limit yourself to logging into social media at the very beginning or end of your day and for no longer than 15 minutes. Every 2-3 days make your posts as needed for business. 4) Avoid checking your phone for updates while in line at the grocery store, walking down the street, working out, or driving. I have been guilty of this, but it obviously proves the SM (social media) addiction. And more importantly it is bad for our posture to be working off phones so often. 5) Do not stop reading books. Paper back, electronic…what ever. Getting through a full chapter or book shows that you don’t have ADD or short-term concentration loss from SM. 6) Do not stop exercising due to SM overhaul. 7) Do not stop cooking due to SM overhaul. 8) Try not to pull out your phone when you are at dinner or socializing with friends / family. These are just a few things I continue to work on to avoid SM addiction. Organization is the first step. The second and hard one is the dedication to limiting your time on SM. Good luck! I would LOVE any comments or suggestions you have. Wow, what a great article- you touched on so many topics I’m concerned with, and also provided useful advice. Even though I’ve been using social media and the web for years I picked up several tips and am going to setup an iGoogle page tonight. Widgets rule! I see we subscribe to a lot of the same blogs. I really dig Cosgrove, Boyle, Gray Cook, and Mike Reinold. Are you going to pick up Gray’s new book? Awesome. Glad you found it helpful. I have definitely decreased my social media time in the past couple of months. I can get in the way of more important things, like golf or training. I haven’t looked into Grays new book yet. Does it look good? I will have to check it out. He is one of my fav PT’s and Trainers. He is a genius and really teaches well. Hope your golf progress is going well! Well written and good advice. Thanks! Good post, Jessica. Your recommendations are spot-on. Thanks for a thoughtful review of behavior related to social media. I would not join a prediction of the downfall of society based on social media overuse, but there is reason to be concerned. I love blogging more than twitter but tweet to support my blog. And I’m not on fb. Social media use is age-related, I think. At 55 I am not ‘native’ to cyberspace, or did not grow-up with it. For me everything related to social media is like learning a new language or culture.